Cyperus helferi is one of those few plants, which actually are not aquatic ones, but they adapt quite well to dwelling in tanks. The plant is a rather popular one and not very challenging to keep. In the wild this species is encountered in South-East Asia. Its natural habitat is in slough waters with lentic or slowly flowing water. Cyperus kind has more than 900 species, among which you can find a renowned house plant and a well known papyrus – this is the plant used in ancient Egypt to make the same-name paper. Cyperus helferi has elongated narrow leaves growing from one center – their rosette. Each bush can grow up to 50 leaves. Height of Cyperus helferi bush can reach 40 cm and the leaf width can be 5-7 mm. The root system is weak and it can’t withstand strong water flow or attempts of large fish to tear the plant from the substrate. Cyperus helferi is one of the plants of medium difficulty in keeping. We can’t call it a demanding one, however long term adaptation to new conditions is peculiar to this plant. 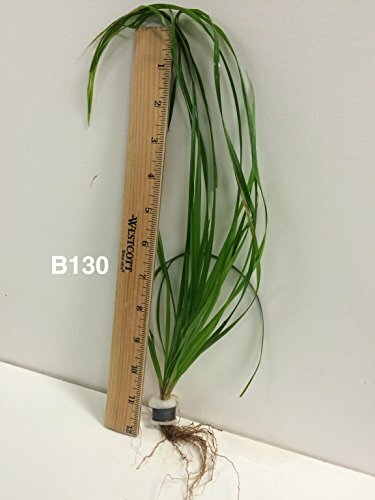 If there is low content of nutrients in the substrate or tank water, cyperus won’t suffer much, but it won’t demonstrate essential growth rate either. Provided with abundance of macro- and microelements cyperus shows stable growth pace. Just like for other tank plants, additional CO2 supply increases this parameter. The plant is quite widespread and isn’t a challenging one to keep. Water in a tank shouldn’t be too warm, since optimal water temperature for the plant is about 22–26°C. Water acidity should be maintained at point not higher than рН 7,2. Cyperus is less demanding in terms of water hardness, therefore it grows well both in soft and medium hardness water. It successfully dwells in tanks with water filtrated by means of reversed osmose membrane. CO2 supply effectively stimulates the plant development rate, however, CO2 supply isn’t a must for it. Due to low growth rate of Cyperus helferi there is a high chance that algae will appear on its leaves. That’s why proper biofiltration of tank water should be organized as well as regular control of ammonia level in the tank water. Imported from the Rain Forrest in Thailand - USDA Certified. The main condition of successful keeping of Cyperus helferi in a tank is good illumination. Adding ground fertilizers or clay balls under cyperus roots is good for the plant growth pace. Small grained nutritious substrate rich with nitrates, phosphates, kalium and other nutrients is desirable for the plant. If the substrate isn’t nutritious enough you’ll have to introduce additional fertilization. It’s better to cut off Cyperus leaves that reach the water surface (near their very bottom). If you just trim the leaf with scissors, it will stop growing further and, as a rule, in time it gets yellow and dies. Cyperus helferi is usually put in the middle plan and surrounded with shorter plants. Also it can be used to decorate backside of small planted tanks or when creating pathways under water. Attractive shape of the leaves as well as their bushy form allows obtaining a fluffy bush in a very short time. Such a bush will eye-catchingly stand out against other tank plants.